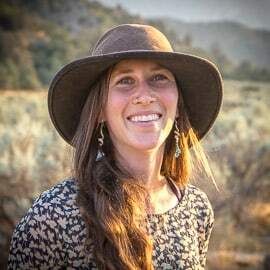 Jen Schlaich has a degree in Environmental Studies from UCSB, earned a Community Herbalist Certification from Pacific Rim, and currently oversees the Food Soveriegnty Program for the Bishop Paiute Tribe in California. Led by her passions for small-scale food production, seed saving, and herbalism, she seeks to inspire engagement with food, seeds, and medicine. She believes plants are capable of bringing about a metanoia, reconnecting humans to their health and stewardship of the places that sustain them. Jen’s past work includes 2+years as an urban agriculture Peace Corps volunteer in Senegal, heritage seed saving at the Koanga Institute in New Zealand, volunteer work with the Jane Goodall Institute, and ongoing involvement with Sustainable Vocations from 2010 – 2017.